I totally agree with this. We need to have our own income and not to depend on anybody. I agree, mommy! Life should always be about paying forward and not the other way around. 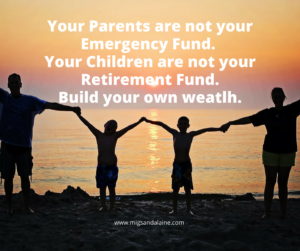 As parents, it’s also our responsibility to prepare also for our future so that our kids won’t be burdened. This is also my goal too, to be financially independent from my children. So this early my husband and I try to invest and save for our retirement. I like the message of this post. Though it is satisfying to help others especially relatives, it is also prudent that we save and think of our own family first.